MLS is in a very unique position. With just two decades of tradition, as compared to the various European leagues and their traditions spanning over a century, MLS has the ability to build their own traditions and their own personality. It got a little crazy in the early going, but now that the waves have settled and the norm has set in a bit, we are beginning to see that Don Garber’s MLS is not opposed to some forward thinking. We have seen it many times this year already. When calls were made incorrectly during the game, MLS will return to the issue after the match has concluded and deal out punishment accordingly. Masato Kudo was suspended for flopping to draw a game-winning penalty and others have faced similar instances of reactive justice. 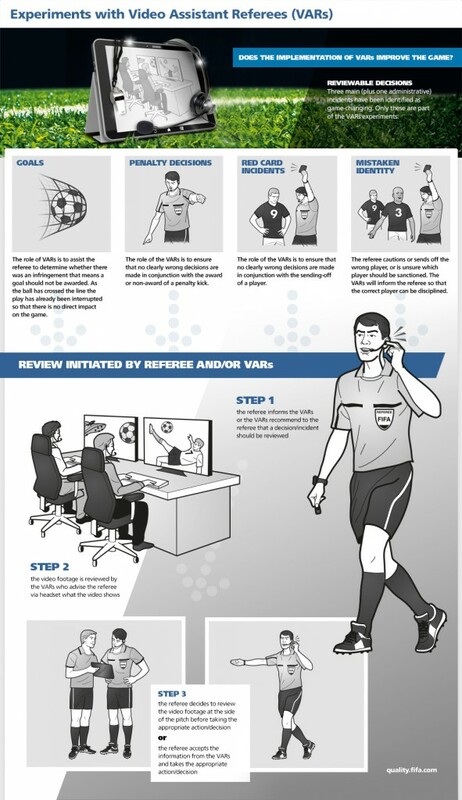 All of this has led to MLS being one of six leagues around the world to experiment with the Video Assistant Referee’s (or VAR’s) as early as 2018. As you can see, it is pretty self-explanatory, and it fits in with that MLS is already doing. Only with the VAR, it will be done in game as opposed to after the game. That way they can avoid awkward situations like Kudo’s, where a wrongly-awarded penalty determined the outcome of the game. It is a promising step in the right direction for all of soccer. Using VARs, flopping can effectively be cut out of the game. It has long been seen as arguably the biggest bugaboo of the most beautiful game and if a quick call from a man in a command center can eliminate it, it should be embraced. However, there is one concern I have with this new VAR system. It covers goals, penalties, red cards, and proper identification, but what about offside calls? Too many times, particularly in MLS, with less experienced referees, offside calls have interfered with a game and had a major impact on proceedings. If all of these hotly-contested scenarios can be looked at by the VAR, why not offside? It would work just like goal line technology, which we have seen work as in as quickly as a few seconds. All the VAR would have to do is use the same kind of technology to determine if a player was behind a line or not. The Assistant Referee would wait for the call and hold his flag up accordingly. The delay would only be a couple seconds, which is usually how long it takes for the call to be made anyway. This initiative is promising for MLS, but to continue to ignore the problematic offside calls is a worrying prospect. Especially when a solution seems so clear.